Cortez L. Johnson and Sylvia M’Lafi Thompson in “Brownsville Song” at Moxie Theatre. Some plays succeed in tapping into the zeitgeist. 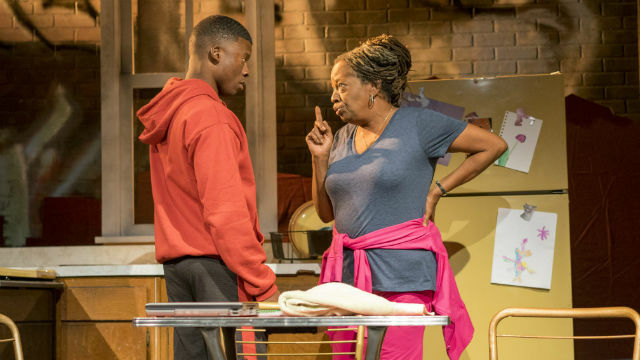 Playwright Kimber Lee hits raw nerve with “Brownsville Song (b-side for Tray),” an intense, one-act drama that puts a face and a family on all those young African American men who keep getting gunned down in their prime. This time, the murder is from within the community, gang-related. In some senses, 18-year-old Tray is an extraordinary kid in his tough Brooklyn neighborhood — a committed boxer; a Starbucks barista; a loving big brother to his half-sister; a boy devoted to his stern but loving grandmother and accepting of the stepmother who abandoned them — and hellbent on going to college, even if the essay-writing part of the scholarship application process is driving him to distraction. This dramatic narrative jumps back and forth in time, from the events leading up to the crime to the grief-stricken aftermath. But Tray is actually the end — reading the essay he struggled so hard to write, about “what it means to be a man in this life.” It’s heartbreaking that he never got to become that man. Lee’s language is rough, rhythmic, intimate, a hip New York patter that is beautifully handled by Delicia Turner Sonnenberg’s outstanding cast. She directed the excellent reading of the play last year at The Old Globe, and now she’s brought it to her own Moxie Theatre, a snug and comfortable fit, where she can adroitly finesse the characters. The scenic design (Sean Fanning) captures the essence of the locale: graffiti spatters the upstage wall, including a giant pair of peering eyes, overseeing a homey kitchen and bedroom. The sound design (Emily Jankowski) features the repeated roar and rattle of the subway. The character-appropriate costumes were designed by a San Diego State University student (Danita Lee), as part of a fellowship program with Moxie. Cortez L. Johnson (recently seen at the San Diego Rep in “Honky”) is a kinetic, charismatic presence as Tray. Zoë Sonnenberg is spot-on as his taciturn, traumatized sister, Devine. Jyl Kaneshiro is aptly tentative and cautious as the addicted stepmom to Tray, mother to Devine, who’s trying to get her life back on track (this character, it must be said, is less interesting and less well defined than the others). And Alex Robinson is perfect as the gangbanger who chalks up the violence to “the game” on the streets (“Body counts be like trophies. You get points for the shot… build up your reputation”). He feels responsible and vows revenge for Tray’s death, revealing just how unceremoniously violence begets violence. There are no answers to this catastrophic cycle. But Lee brings us up close to one kid and his family (based on a real budding Brooklyn boxer who was gunned down), and she underscores the importance of family unity and forgiveness. In the final moments, Tray’s essay offers a message of hope to young African American men: “You define your own life… I’m writing my own story”). Tragically, his story, like far too many others’, was cut short before it could reach a proper, self-defined ending.